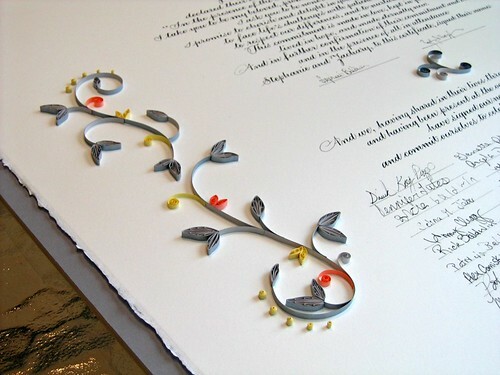 Until about a year ago I could often be found quilling commissioned marriage certificates and ketubahs that would be framed by the newly married couple, or matted wedding invitations that would be given as a gift. 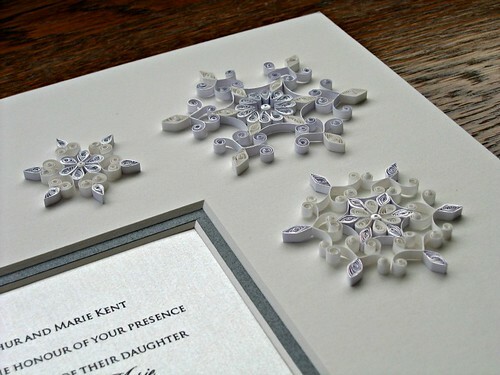 I'm on hiatus from wedding quilling while I work on other projects, but I understand that many of you arrive here in search of ideas, either for your own wedding or while in the planning stages of making a special gift. 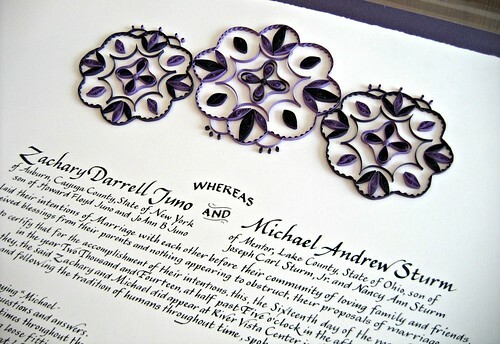 In this round up you'll be able to see many of the quilled marriage certificates and invitations I've posted on the blog over the years all in one convenient place. 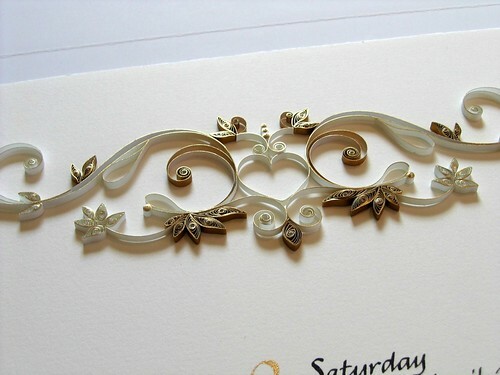 For more images and information about each design, as well as wedding quilling tips, click the link under the photo. 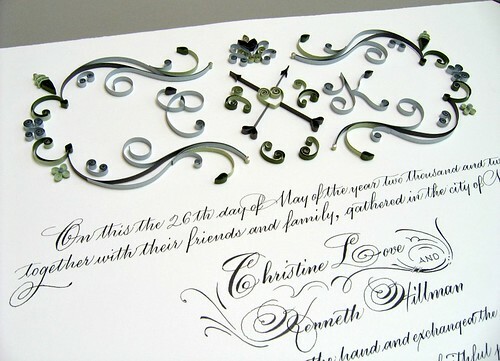 You'll also find a link within each post to the professional calligrapher who did the lettering. 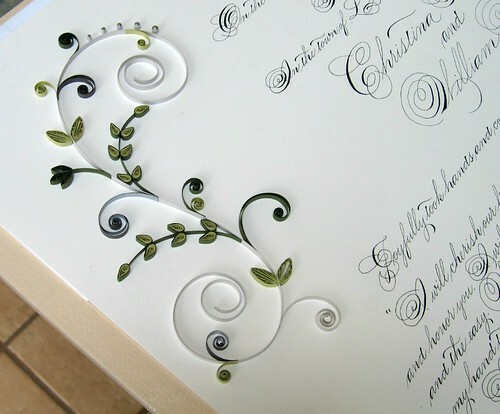 I've always loved the look of gracefully curved scrolls... in fact, they were the first thing about quilling that caught my eye, so it's no wonder I often use flourishes in my designs. 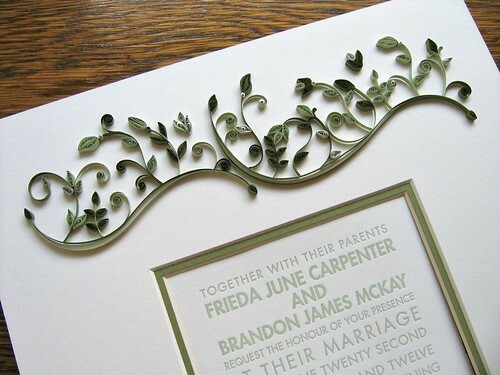 And luckily, scrolls are frequently seen on printed wedding invitations. The one below was practically begging for a quilled mat! 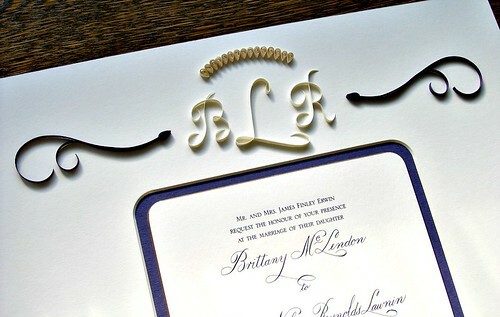 Monograms are popular and truly personalize a piece. 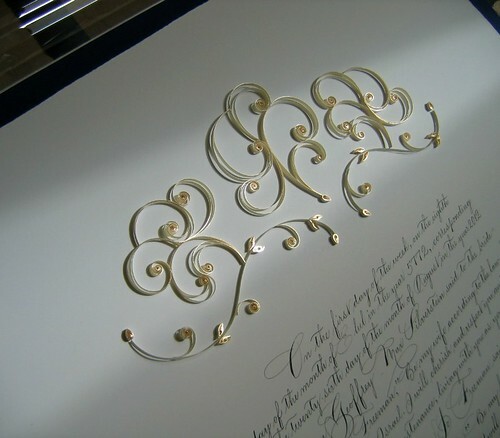 Pardon the odd angles of the photos... it's tricky capturing the shine of gilded-edge paper, not to mention the nuances of quilling. Why am I posting these now? Honestly, few things make me happier than encouraging others to learn to quill and providing design inspiration for those who struggle with creativity. If you fall into the latter category, I promise you that the more frequently you quill, the better the chances that you'll develop your own style. 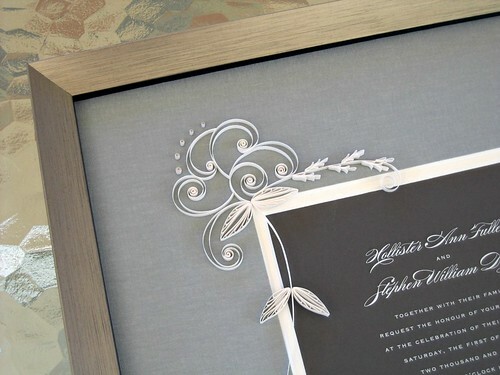 Because these custom designs were tailor-made for my clients and their particular requests, you will want to incorporate your own ideas and/or your client's ideas into your work.... trust me, it's far more satisfying than replicating, not to mention more ethical. 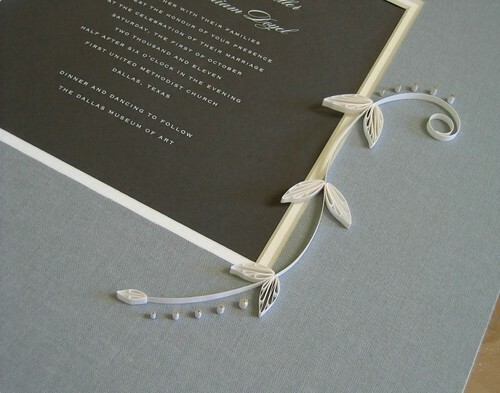 For a wedding invitation mat, take cues from the invitation itself... mimic the curves of the script or the flowers in the art work. Careful though... less is usually more. Each coil and scroll should serve a purpose and there's no need to fill all the space. This is the first Quaker marriage certificate I completed... a request of an engaged student at one of my classes. It was a big project (i.e. 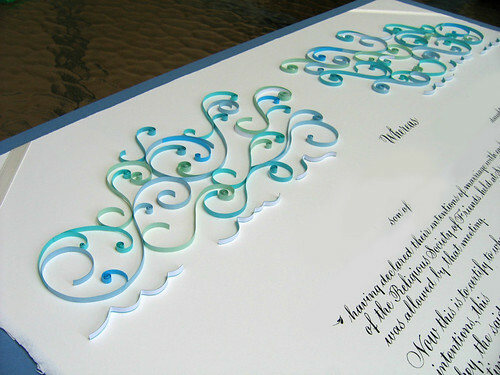 many hours) as certificates and ketubahs are quite large (22 x 30 inches) to allow room for signatures. 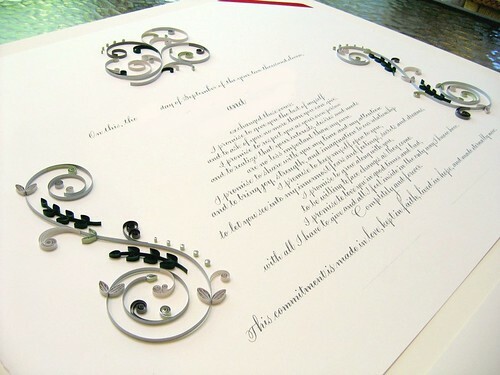 If you are wondering what a ketubah is, it's a Jewish prenuptial agreement signed by the couple, rabbi, and two witnesses. 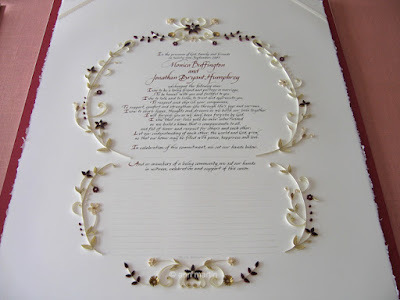 Traditionally read out loud during the wedding, it is framed after the wedding and hung in the home as a reminder of vows and responsibilities to one another. 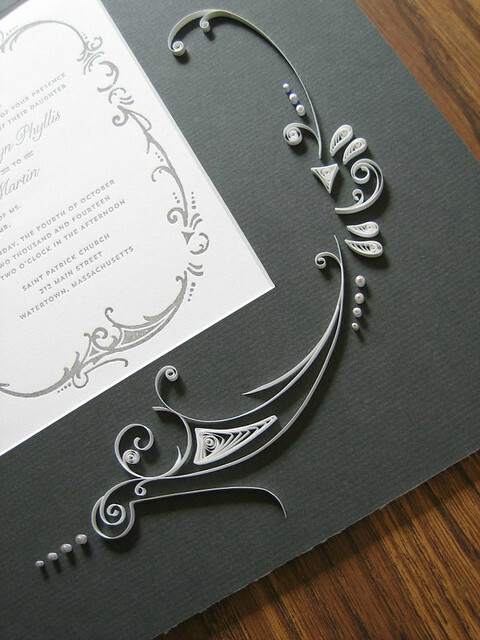 The design was inspired by the printed pattern on the invitation. Recognize the certificate below? It's the design that does double duty as the site's header image. The bride requested a chandelier at the center top. 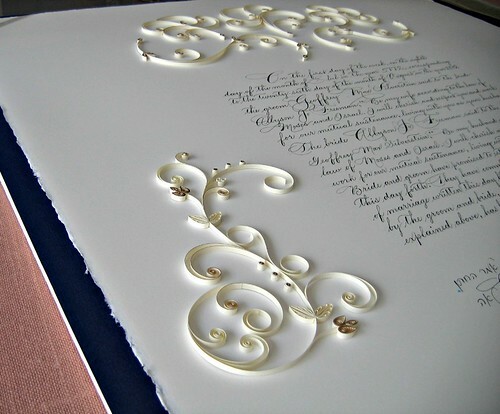 Large S scrolls have often been popular with clients, but oh boy, they take lots of measuring to mirror one another perfectly. 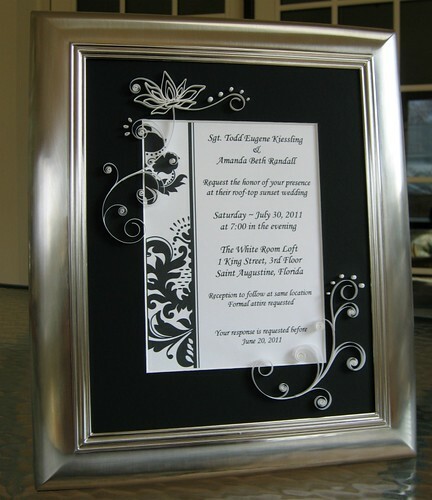 This woodland design was another popular design that I customized with different creatures per clients' requests. 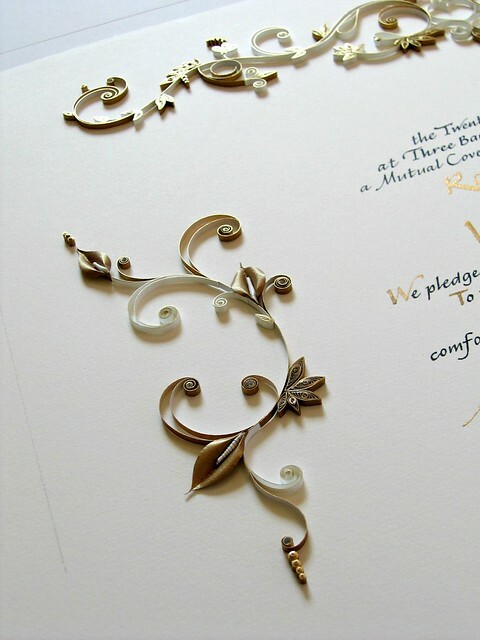 I've done variations of this modern scroll invitation quite a few times. 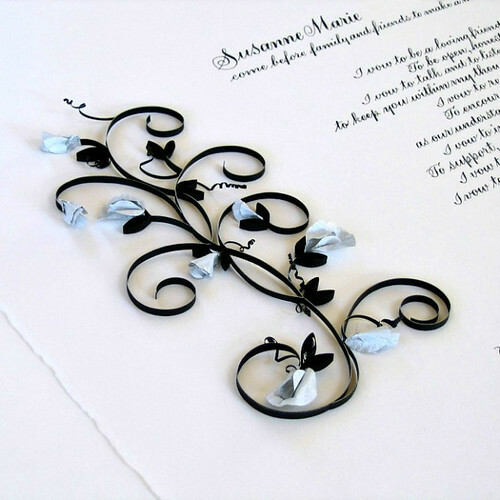 ...and I was given carte blanche for the invitation below, so I quilled tiny seedlings, appropriate for the time of year and the start of a new life together. 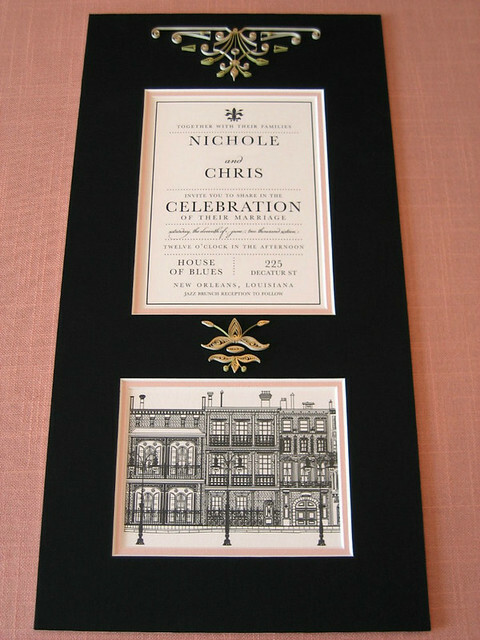 Usually the client takes care of framing, but in this case I purchased a ready-made frame to hold the invitation mat.... nice to hang or stand on a table. 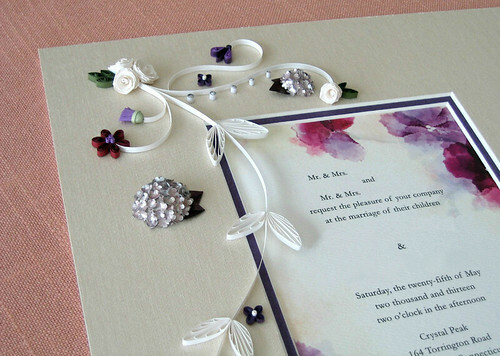 Vivid colors were requested for a summer wedding. 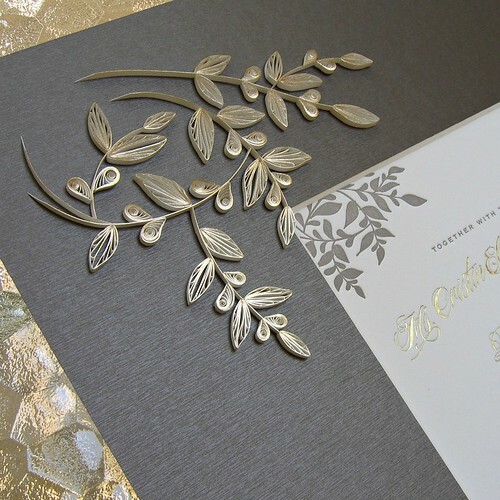 A similar palette toned down by gray. 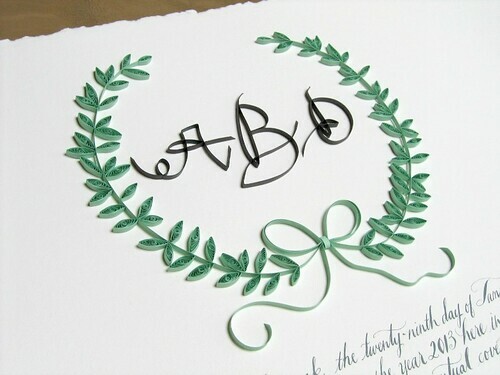 I quilled it after the wedding so guest signatures were already in place. In Quaker tradition, those who are present at a wedding sign the marriage certificate as a show of support for the couple. Non-Quaker couples have adopted the idea and sometimes use it in place of a traditional guest book. I did this monogrammed design for two different couples... the first requested a tiny ice cream cone in each corner and the second couple opted for calla lilies. 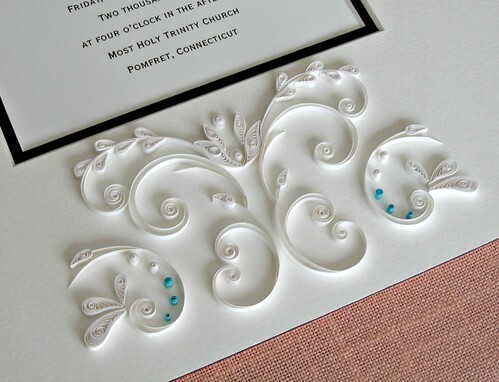 You'll need to click over to see the damask pattern printed on the invitation below to understand why I came up with this white and aqua design. Hydrangeas, white roses and thistles on this mat were reminders of the wedding flowers. 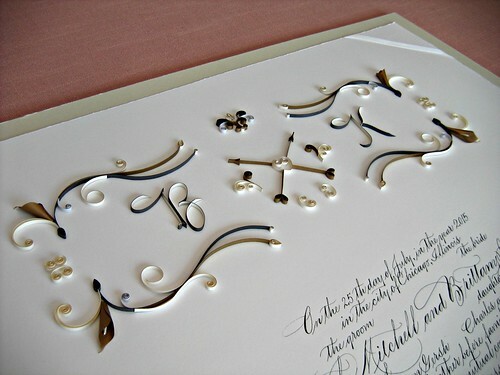 This was a certificate that the bride planned as part of an anniversary celebration. 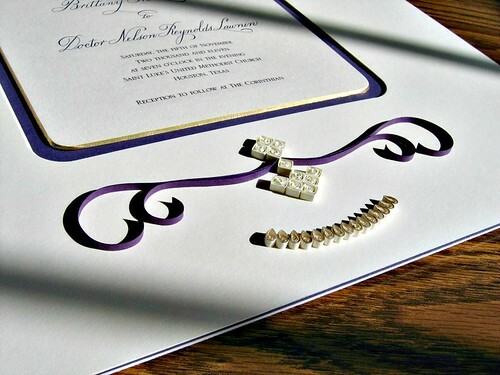 The design references their wedding invitation from 15 years prior. 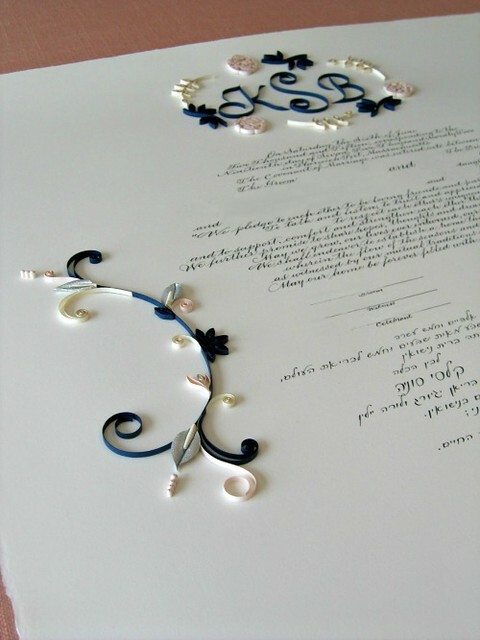 Ivory, blush, and navy with silver foil calla lilies made for a dramatic palette on this ketubah. 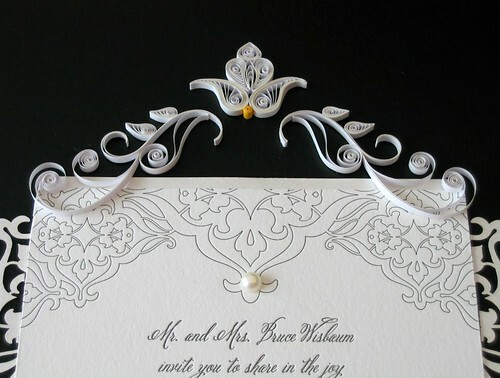 Do you have a favorite design you enjoy doing time and time again or questions about wedding-related quilling? Let me know in the comments below. 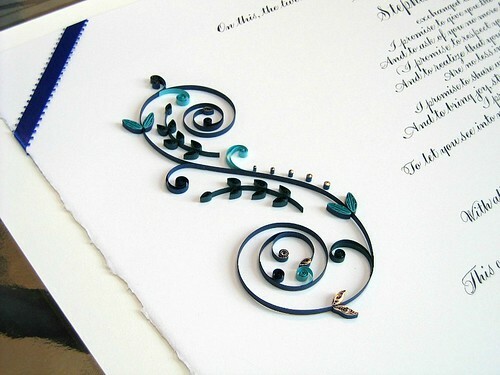 I am in love with these adorable quilling art. I would be more than happy to receive such kind of invitation. Thanks for posting these all together....they are beautifully done and all so different....some I hadn't seen before....very inspiring. Thanks so much, anon and cate! Muito lindo! 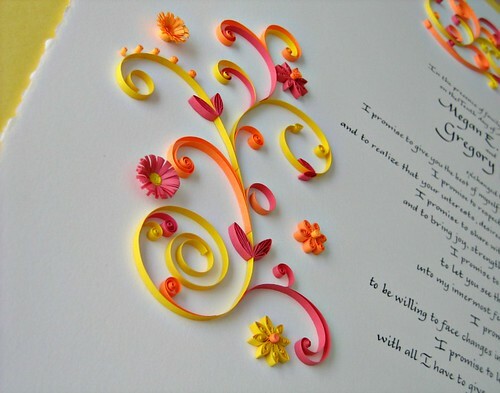 o papel é especial ou é o que usamos normalmente para quilling? Obrigada e parabéns. Thank you, Nadja! 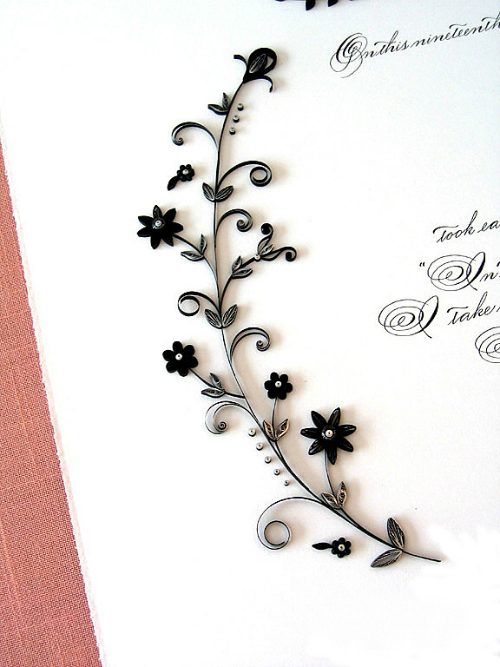 Yes, regular quilling paper. Sometimes I glue two strips back to back for extra strength.